Poe Occultist is the hottest Ascendancy class in Path of Exile: Synthesis. Occultists are suited for Witches using a concentrate on the harm inflicted continuously more than a time frame. Unlike the other 3 damage sources, damage as time passes will not hit, with cold harm or chaos damage and curses. 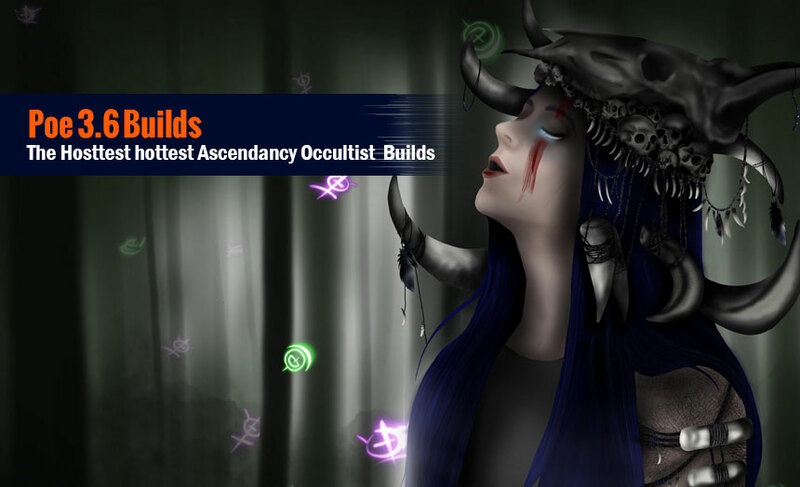 Malediction is an Ascendancy passive skill for the Occultist. It raises the further curse limit by one, increases the effect of one's curses, and causes enemies you curse to possess Malediction, decreasing their harm and growing their damage taken. Also, killing a cursed enemy grants a buff that grants additional chaos harm per curse the killed enemy had primarily based on all sources of non-chaos damage. Right here We will share Poe 3.6 Occultist Builds for you personally. Enfeeble: Less damage from enemies, Critical Strike. Temporal Chains: less Action Speed from enemies, less Action Speed, slower. Your Curses can apply to Hexproof Enemies. Chance for cursed enemies to explode increased from 20% to 25%. Enemies killed by your minions now also have a chance to explode. It's hard to help you with that without seeing your play style. But honestly investing on CDRS won't help you so much cus the cooldown is not so high and you'd need too much CDRS to make some difference. - Using Flame Dash is not the best movement skill but the Quicksilver Flask helps on that. - Some endgame items can be more expensive cause Cold Damage Over time builds are a bit hyped. - Less recovery rate map mod is not so good. Major God: Soul of Arakaali. This build includes a truly wonderful blend in the two single targets and AoE damage, survivability, movement, and magic find. Survivability is linked purely to your ability to freeze factors, regenerate ES, and prevent harm. There is nearly no mitigation. Righteous Fire Juggernaut, this is not. Surviving endgame bosses (T16 Guardians and other folks that can't be frozen) involves knowing the mechanics, keeping away from the damage, and killing the boss immediately. From time to time this means you have got to skip map bosses as the mods make it so that you cannot prevent the harm. A single example is, the Reef boss is normally a joke, but I skip it anytime it has an "Increased Region of Effect" modifier mainly because it is too uncomplicated to die within the phases wherever the boss is immune. Interesting thought. Maybe after getting a few more levels will take a new character through maps with it and make some leveling advice if it works out. My impression last time tried to level a build like this is that it's too dependent on having amazing low-level ES gear. There are almost zero life nodes taken and %ES nodes don't do much when you just don't have very decent gear. 1. The build has roughly twice the harm and 5-10% more ES than 3.5. It should feel a LOT better with average gear and it feels broken now with GG gear. 3. Passive tree significantly reworked. Here's the new suggested tree. 4. Hatred watcher's eye with a +crit chance is now insane. Get an ES/clarity and Crit Chance/Hatred Eye if you can. + Good "Jack of all trades" build. + DPS that scales up to insane DPS with enough gear. Unbuffed ~2M DPS shaper DPS with good gear, ~4M shaper DPS with GG gear. + DPS for this build is just pure, raw, unconditional DPS. + it is only under super specific conditions. + inflate Path of Building numbers. + Top Tier clear speed for mapping. + Can run decent Magic Find without sacrificing anything although clearing up to T16 maps. + Farms red Elder and Elder Guardians effortlessly. + Shaper is easy. Uber Elder is pretty easy if you know the mechanics. - As a "Jack of all trades", this build is also master of none. If you want to specialize in something very specific (farming a specific boss, or pure pack clear speed even though ignoring bosses, going maximum magic find, etc), you should probably find a more specialized build. The way in which that the vortex/Frostbolt interaction will work if you just send out the Frostbolts and then hit your vortex button when those Frostbolts collide with an enemy some items transpire. 3. The vortex AOE is left under their feet for the dot dmg. As far as why we think life is better, is because you have to invest a lot into ES on gear and tree, leaving you no room for any other kind of mitigation. This leaves you vulnerable to getting hit. A lot. With life, you have acrobatics to give you 30% dodge, and another 50% evade, plus the block chance of the shield. + VERY cheap, no uniques required and more Poe Currency. + Vortex is instant cast! - The good portion of damage is on the back-end rather than front-loaded. All in all, locating a build that fits me and has all of those items can genuinely be a tall order to fill. Props to your OP for this build. Quite good and relaxed transition into mapping. Specially for memory runs this build has quite nice utility with both phase run and flame dash. The inpulsa's explosion result is a quite great clear-speed excellent of a lifestyle of improvement on this build. Quite quickly and cheap league starter for Synth to date! Thanks! Ive been undertaking it like this final week: I would propose capping your resistances very first though operating all around as part of your levelling gear. Then I would go for a pseudo 5 website link with >lvl 18 slower projectiles to start with. So the gloves. This will price you all-around 5chaos. Then a pseudo 5 website link to your vaal be (~3 chaos orbs). After this, I would go to get a ordinary Kaom's Heart that will value you all around ~1.6 Exalted Orb. Try to obtain a corruption altar within your Incursion (your Temple) and go yolo with your Kaom's Heart. Though you happen to be endeavoring to get the corruption altar it's possible to purchase an ilvl >76 (I think) elder ring and alteration spam it for your warlord's mark. I received unlucky on this so I ended up buying one particular for all-around 50c. I chose to purchase a cheap jewel with corrupted blood immunity while saving up for that Anatomical Know-how. This kinda covers to low-cost portion, but now you got the bare survivability essentials I'd say. With regards to your belt as nicely as your boots, it truly is essential that you have a ton of resists on them as it may nicely show challenging later on this max them out. After this comes the a lot more expensive aspect. Having the necklace, the anatomical awareness along with the green nightmare jewels, the pseudo 6 hyperlink + enchant helmet and gloves. It kinda depends on the material youre pushing during which order you'd want to upgrade this. Additional dmg vs. far more survivability. - Hexproff AND no regen on the same map should be avoided. Major God - Any will work but the Soul of Lunaris for added projectile avoidance, dodge, and no chained projectiles. Gem Levels vs Excellent are hard to balance from the end game so employed Max vs 20 to demonstrate which ones are most important Clearly if you can obtain a level 21 gem with 23 excellent you must in situations the place they're both listed as essential. The only exception to that is Ice Spear That is an odd situation, but you don't want projectile speed as it will make your damage decrease once you get near enough to cast frost bomb as we are scaling the second phase of IceSpear. Tend not to Excellent your Ice Spear. + Not flask Dependent - Flasks just bump dps and give you your safe suffixes but finished all guardians without flask charges up. - You need to understand the basic mechanics of your character, itemization and the game to play this build... e.g. the importance of resistances, what is LL, how you get to the end game in a chaos mitigation/immune situation, and how to scale harm, particularly in the time leading up to the Shavronne's wrappings. - Looking at your offhand Don't do it six aurae's to restart, and with no life regen, you won't be able to without a portal just don't unless you travel to town first make a trip to Oriath so you don't have to lose them sadly portal gem in offhand is a total no-no.